7-11: An international chain of convenience stores that's just recently opened here in Iloilo City. Munsterific: A local/semi-national chain of convenience stores that has roughly the same offerings as 7-11. So anywayz, I've previously only had the occasion to taste Munsterific's 15-peso sugar cone myself once or twice, but a friend told me that 7-11 served more ice cream using the same type of cone for the same price... so, being an objective individual living in contemporary times, I wasn't just about to take that hook line and sinker; and thus, I set out to put said friend's contention to the test. I believe the pictures speak for themselves here. The cones themselves are identical. 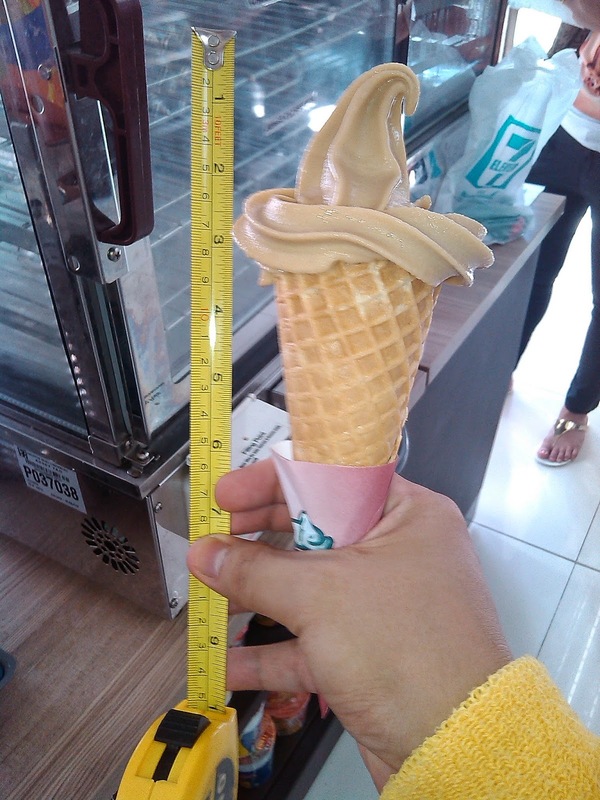 The brown ice cream is 7-11's Fundae Cone and the vanilla ice cream is Munsterific's Sugar Cone. 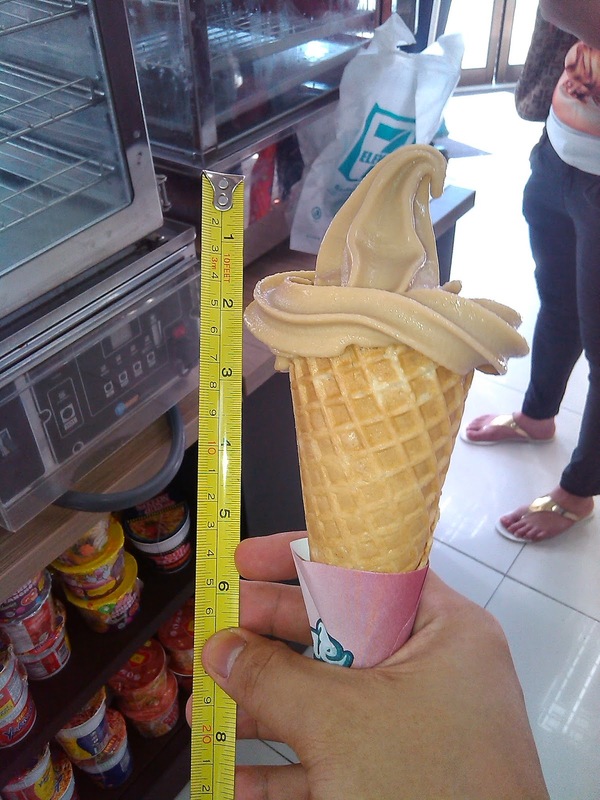 As you can see, when it comes to size, both soft serve cones are more or less equal. These are regular servings from both stores as served by in-store employees without me prompting them beforehand that I'd be taking out the old measuring tape. 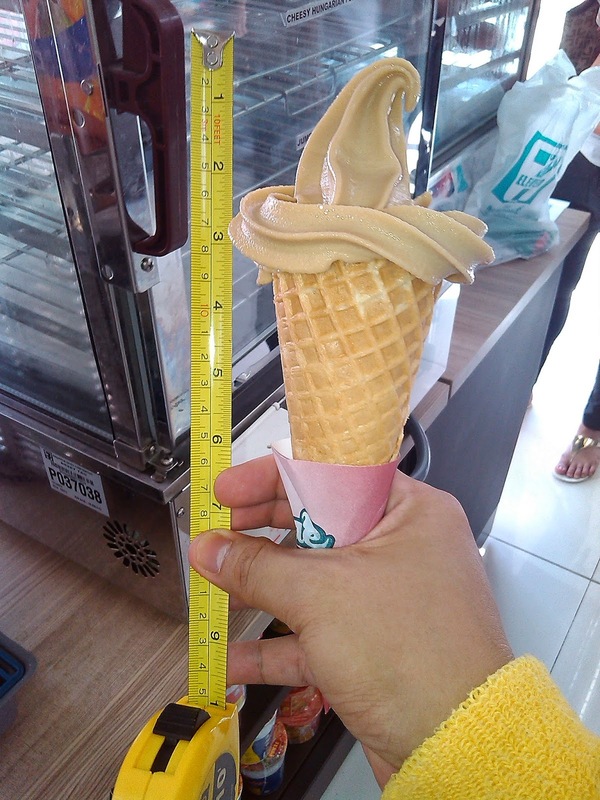 You'll notice that the 7-11 cone has a wider serving around the tip of the cone, but that the Munsterific Sugar Cone seems to be piled up a little bit higher. 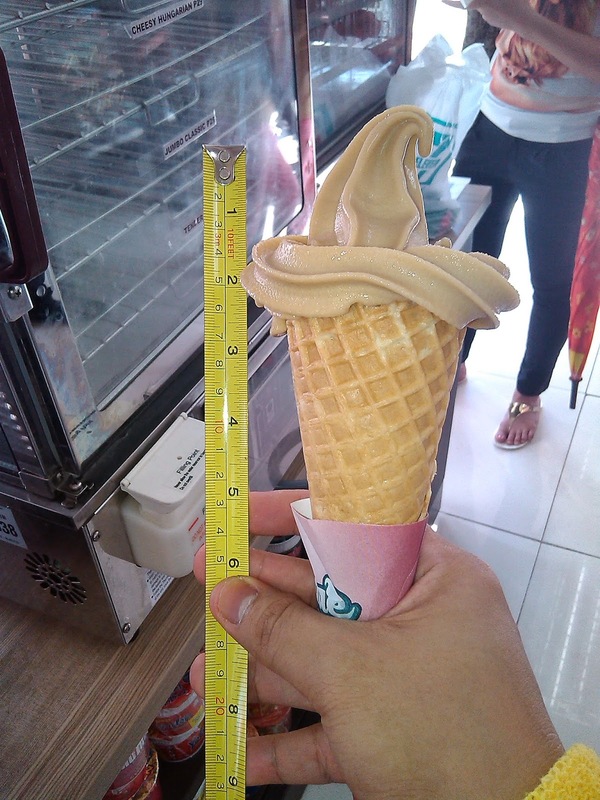 When it comes to the actual amount of the ice cream that actually ends up on both cones, I would say they are roughly equal. 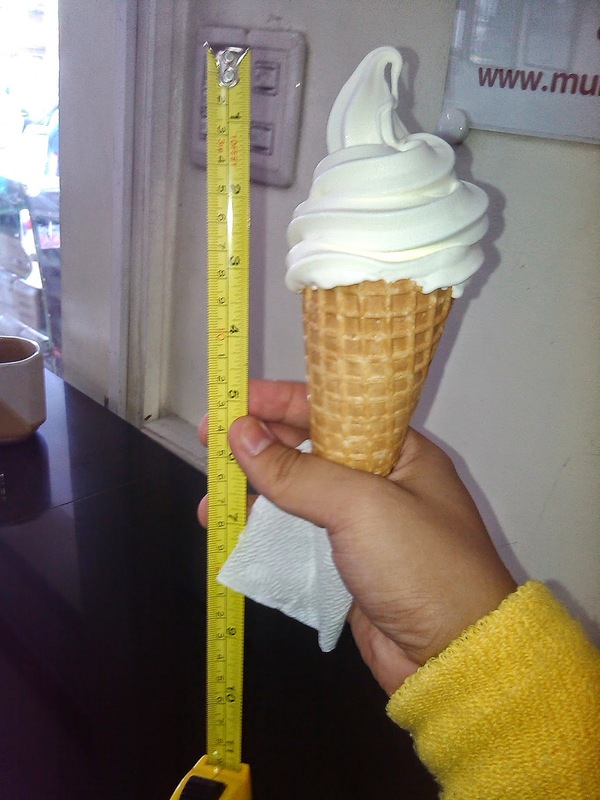 I took several shots of each cone and together with the ice cream, I think we can safely conclude that both soft serve cones are about 8 cm. each. I opted to take different-colored servings of each type of ice cream in order to be able to differentiate them a lot easier in the pictures. The Fundae Cone soft serve has a rougher, grainy looking texture visually while the Sugar Cone soft serve seems a lot smoother and milkier. As their appearance would suggest, the Fundae Cone soft serve has a slightly grainy texture on the tongue while the Sugar Cone has a very creamy texture. 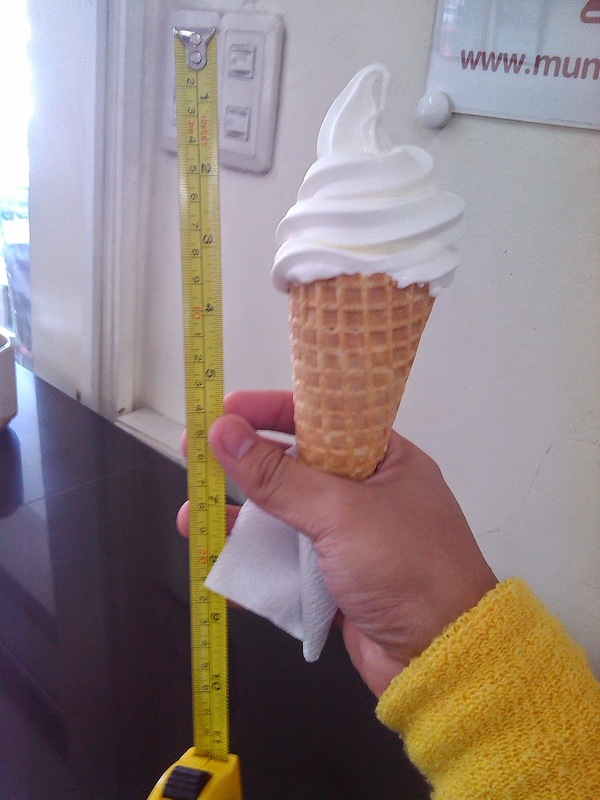 This is subjective, but the Fundae Cone soft serve tastes a lot like the "Snowpy" soft serve ice cream served everywhere here in Iloilo City and tastes a bit artificial. Meanwhile, the Sugar Cone reminds me a lot of the kind of soft serve they use at McDonald's. I would say that the Fundae Cone has the slight edge when it comes to the wafer cones since the cone seems slightly crunchier in comparison to the Sugar Cone. 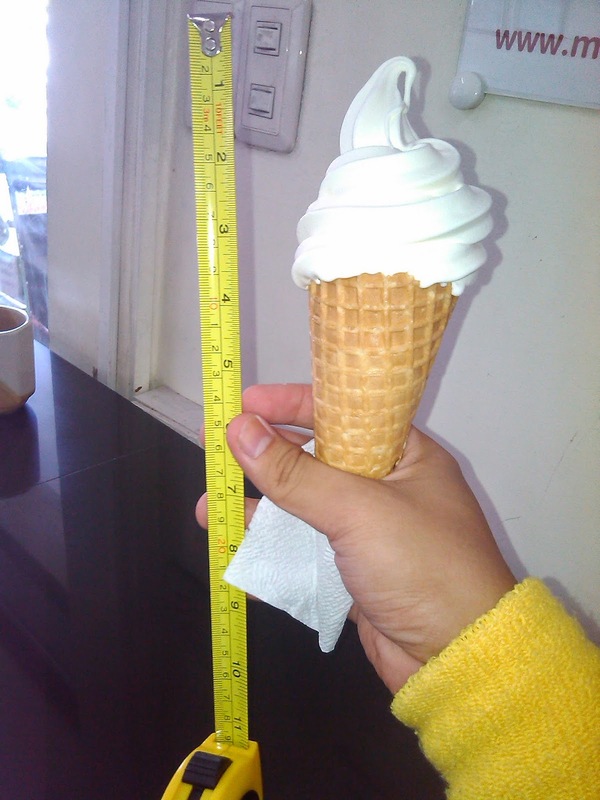 Over-all, I personally prefer the Sugar Cone since the difference between the quality of the wafer cones is negligible, but I would say it has the superior-tasting soft serve. 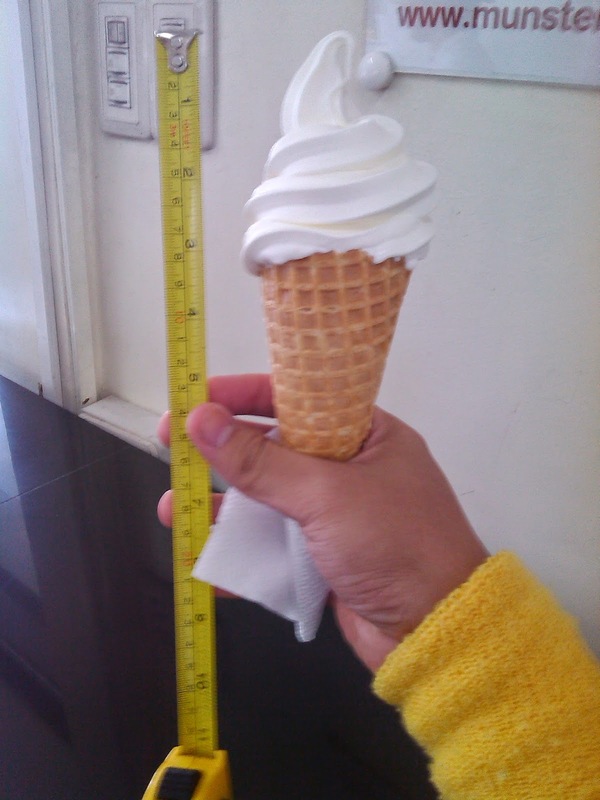 At 15 pesos each and being roughly the same size as each other, you can't really complain about either soft serve cone. I'm not endorsing either of the convenience stores mentioned here, but hey, both ice cream cones are cheap, delicious and well-worth the price -- especially in this scorching weather.